A group of USC students under the tutelage of Professor Lisa Schweitzer produced the above chart, which seems to show a direct correlation between gas prices and ridership in Southern California. Simply put, when gas prices fall, so does transit ridership. When gas prices rise, so does transit ridership. The equation is not that simple; correlation does not mean causation. 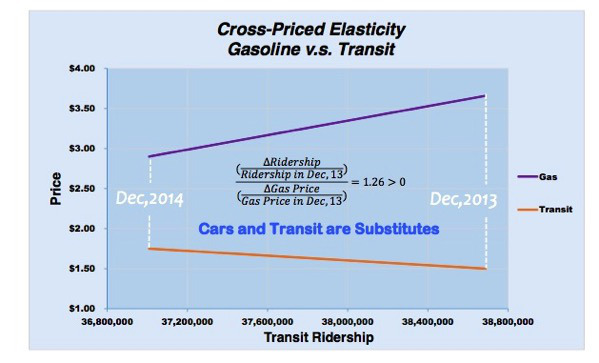 But is there a causal thread between gas prices and transit ridership? While the above chart ends in 2014, a look at the existing data for 2015 shows the basic trend continuing. This chart, provided by Los Angeles County Metro shows that gas prices in the region have fallen since 2015. Their year-to-year ridership comparison also shows a dip in overall ridership. There has been a lot written over the years about the relationship between the cost of gas and ridership. While others have certainly echoed the findings above — and it certainly seems intuitive — the American Public Transit Assn. has lately been making the case that the gas/ridership relationship is eroding in many cities across the U.S. where transit has been expanded (i.e. people are taking transit because they prefer it to driving). Of course, California’s special blend of gas — intended to help reduce smog — means that gas prices here are always higher than most parts of the U.S. That said, Metro has seen a ridership dip beginning in April 2014. In the time since, gas prices have ping-ponged considerably. While that may be true, it doesn’t account for the fact that transit ridership is dropping in the Southland and anecdotally, this may be true statewide. Anecdotally, some are saying that laws that allow undocumented residents to obtain drivers licenses are a major reason, but there’s little data to back up this assertion. Predictably, when the media is looking at the impact the new law allowing this group of immigrants access to driver’s licenses they don’t even think about the impact on transit ridership. So while the USC findings reinforce the idea that there is a link between the cost of a tank of gas and the likelihood some will seek alternatives to driving; Hymon is likely right that the direct link has not been shown yet. 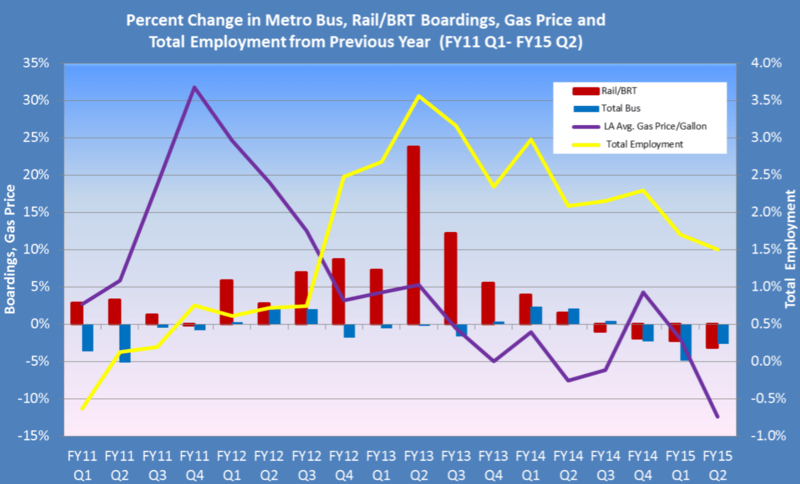 Metro did not look at relationships between ridership and seemingly very pertinent factors: transit service and fares. During the past couple years (at least), Metro has focused resources on long-term capital projects including rail system expansion. With no new rail lines opening since 2012, and twice annual “service adjustments” that cut bus service, Metro has cut overall transit service. Additionally Metro raised fares in September 2014. Ridership during the following three months was down 4 percent compared to the prior calendar year. Not all of any ridership decline is attributable to any single factor, but fares and service likely play key roles in influencing ridership. Metro’s own budget analysis [PDF] concludes that there is no discernible correlation between gas prices and ridership. Nor are there correlations with a host of “external factors” studied: car sales, school enrollment, Uber, Lyft, or bicycling. The only relatively strong correlation the agency found was between ridership and employment, especially in the manufacturing sector. Predicting and, even more important, increasing ridership is complex. While gas prices likely play some role, the price of gas is something that transit agencies have no control over, so it may be more instructive to focus on what investments agencies can make to increase ridership. Jarrett Walker and others have praised transit service reorganizations in in Houston and Omaha (and planned for L.A. in 2016) that serve more riders without adding resources. As Yonah Freemark points out, though, the success of transit depends not only on transit investment, but how it compares to investments made in other modes. Metro is spending billions on L.A. rail, but also billions on widening L.A. freeways. Will transit come out ahead? Will a rise in gas prices make transit agencies look great? Or will continuing cheap gas make transit agencies look dismal? Or will some other external factors, such as technological advances or shifting demographics, outweigh current trends? Cost of gas: $3.00 per gallon. A bus fare costs less than gas for a >15 mile trip, a rather long trip via transit. In other words, you’re probably not going to save on gas by taking a bus instead. If there’s free parking at work, you probably won’t save money on net (your other car costs are more or less fixed, unless you have Metromile for insurance). Parking cash-out/non-free parking, employer subsidized transit passes and high density/TOD enabled carfree-dom are much more likely to generate transit use than increasing gas prices. In other words, remove car subsidies and car-centric land use policies.